So Ali picked up a $12 baking and pastry cookbook for kids. “I thought, if I could make my own brownies and cookies for 12 bucks, that’s a good deal,” he recalls. “I started working on every recipe.” Then he graduated to all kinds of foods. He started cooking breakfast, lunch foods, pasta, you name it. “The next thing I knew, I was cooking dinner for my whole family and leveraging meals to not have to do chores with my sisters,” says Ali. Chef Ali continues to keep himself along with many others away from disappointing meals. His culinary reach has exploded. A regular contributor on ABC’s The Chew, he has a catering business, Roblé & Co which was chronicled in the Bravo show, Chef Roblé & Co. His restaurant Streets serves global street food in Williamsburg, Brooklyn. He’s cooked for Michelle and Barack Obama, Leonardo DiCaprio, Chris Rock, John Legend, Jack Nicholson, Rhianna and countless other stars. 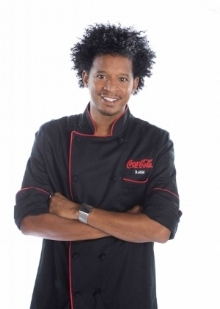 Most recently, Ali teamed up with Coca-Cola on their new “Serve with a Coca-Cola” campaign to show how the drink can complement any dish and help people discover new foods and recipes. “I’ve paired it with everything from BBQ to street-food, haute cuisine and everything in between for as long as I’ve been cooking,” says Ali. Ali shared more with Parade. What were some of those early meals you made for your family? I also got really good at cooking pastas, simple stuff, like spaghetti Bolognese with a little bit of parmesan from the can. That was before I knew you could shave fresh parmesan. It was a home run. Your restaurant Streets in Williamsburg, Brooklyn, serves global street food. Where do you get your inspiration? Ali: Overall, I got my inspiration observing other chefs. When I was growing up, I watched the Food Network and watched my mom, dad, aunts, grandma, my great aunt. My grandfather actually cooked for JFK one time. My great uncle is from Somalia. Half of my family on my father’s side is from there. In fact, there’s a really cool coincidence. Back in the late ’50s, early ’60s, my great uncle brought Coca-Cola to Somalia. He took a great part in building the Coke production facility there and he owned movie theaters. So at Streets, there is Somali food on our menu. We have lots of Caribbean, South American and Pan Asian food. We also have food from my travels from all around the world. How do you find the best street food when traveling, especially when you want to have a sense of authenticity? Ali: Study before you get there. Watch Anthony Bourdain. He has been to all these places and done a lot of the work for you. I watch Bourdain before I travel. I know I’ll learn something. He has people working on finding the best stuff. Also, always talk to local people. They are your best source of information. And look for long lines. If the lines are long it’s probably worth the wait. Ali: I always wanted to work with Coca-Cola. I knew that it was going to happen at some point. It had to because of the law of attraction. You think about something long enough and believe in it, it can come to you. I was a fan of Coke since I was a kid. It was part of my household. My Dad used to refer to Coke as “red can.” ‘You want a red can?’ I’d say, ‘yes sir, I would love a red can.’ I love pairing food with Coke. Once I started running restaurants, and now owning restaurants and catering companies, I like offering people what I like to eat. How did you get connected to cooking for celebrities? Ali: When I started working at a nightclub called Avenue, we served celebrities every night. After a while people got to know me. I’m talking about people like Johnny Depp, Rhianna, Lady Gaga, Kanye West, Justin Timberlake, Leo DiCaprio, Chris Rock, you name it. It was a who’s who. I even catered events for some people there at the space during the day. I did an event for 50 Cent, the Olsen Twins, Derek Jeter. I grew up watching the Yankees. You have cooked for some very famous people. I imagine it’s hard to pick one or two, can you mention some of your favorites? Ali: Well, of course President Barack Obama and Michelle Obama. I have been in the White House four times. What surprised me was how down-to-earth, approachable and nice they are. I remember when I met Michelle she gave me a hug and said, ‘I know who you are. I’m very proud. Keep doing what you’re doing.’ I almost started boohooing right there. But I sucked it up. What do you love about being on The Chew? Ali: Working on The Chew is a lot of fun. I get to work with a wonderful panel of people. I’ve been a fan of Carla Hall since her Top Chef days, and of course, Daphne Oz. They have a great team. They put up great food. It’s so prepared. My favorite thing about doing The Chew is being able to work with Mario Batali. I grew up watching him on Food Network. I love what he does. He’s a great teacher and I learn a lot watching him. Imagine being able to work with your idol. Imagine that.